Prime Minister of Ukraine Volodymyr Groysman has stated that the government had not made any decision on signing a new contract with the management of NJSC Naftogaz Ukrainy. "The government decided that on March 22 the five-year contract with the management of Naftogaz Ukrainy expires and will be terminated on the terms that have been five years. As a shareholder, we have a question about the amount of remuneration for the company's management. We turned to the supervisory board. 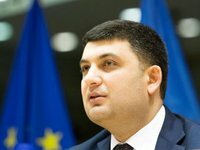 The government did not make any decisions about signing a new contract," Groysman said at a meeting of the board of the Ministry of Social Policy in Kyiv. According to the Ekonomichna Pravda edition, on February 22, 2019, the supervisory board of Naftogaz sent a letter to Groysman and the Ministry of Economic Development and Trade in which confirmed the need to extend the employment contract with Andriy Kobolev for three years. The supervisory council also attracted an external consultant who confirmed the market level of the monthly wage in the amount of UAH 2.08 million offered to Kobolev. Earlier, the head of Naftogaz announced the decision to transfer all his wage and other income received during 2019 for charity.